Athens, Greece, has officially been nominated to run for the title of “European Best Destination 2015″. The competition has been launched by the European Best Destinations (EBD), a European organization based in Brussels and developed to promote tourism in Europe. 20 European cities will compete for this trophy between January 20 and February 10: Amsterdam, Athens, Barcelona, Berlin, Bordeaux, Brussels, Istanbul, Innsbruck, Lisbon, Ljubljana, London, Madrid, Milan, Paris, Reykjavik, Riga, Rome, Valetta, Vienna, Zagreb. The winner will be the city with the most online votes! 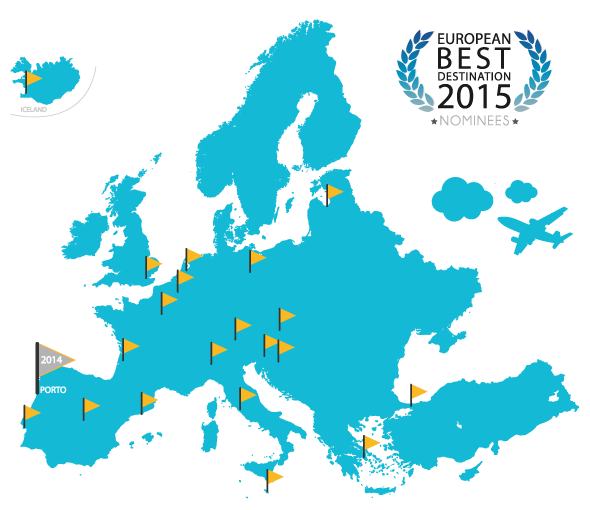 One of the 20 destinations will be awarded the title of “European Best Destination 2015″. The next nine destinations with the highest number of votes will be announced through EBD’s communications, website and social networks as being one the best European destinations to visit in 2015. The 2015 best European Destination will be authorized to use the title and affix the “European Best Destination” logo on all its communications, adverts, website and photos; it will also have the right to authorize its own public and private partners to use the logo. The destinations in the Top 10 can also use the logo by indicating that they have been chosen as one of the ten best destinations to visit in Europe. Their news, photos and videos will be shared by the European Best Destination organization’s website and major social networks throughout the year. According to organizer EBD, the election of the European Best destinations receives substantial coverage right across all the various media in Europe. The advertising equivalent of such a campaign is estimated at 10 million euros. “The number of visitors increased by 16 percent in Porto (2014 winner),” the EBD organization said. Is there anything better than cycling? A new exciting train tour .